Prime Plaza Hotel Purwakarta (formerly Kota Bukit Indah Plaza Hotel Purwakarta) is the only five star international standard hotel in Purwakarta. We invite you to experience "THE SIGNATURE OF INDONESIAN HOSPITALITY" in our hotel. Prime Plaza Hotel Purwakarta (formerly Kota Bukit Indah Plaza Hotel Purwakarta) has 187 guest rooms including superior, deluxe and suites as well as a comprehensive range of facilities including international coffee shop, deli bakery, eL Kafe, karaoke and lounge bar. The hotel recreational facilities include 25 meter outdoor swimming pool with open-air pool bar, beach volley ball, gymnasium, tennis court, futsal, kiddies pool, rental mountain bike, spa & aromatherapy, sauna, fishing pond, golf driving range and outbound team building. 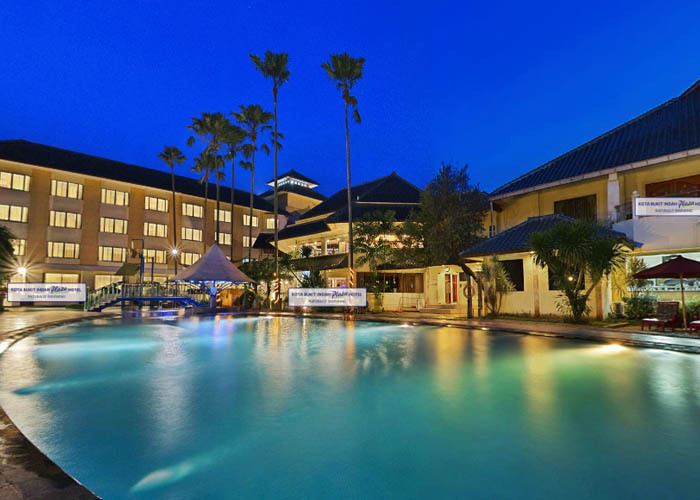 Prime Plaza Hotel Purwakarta (formerly Kota Bukit Indah Plaza Hotel Purwakarta) is a business class hotel set in a resort environment with a low rise design situated in surrounded by greenery and rice paddies, far from pollution and city crowds. It is an ideal place for meetings, training, and seminars or simply for family leisure breaks.